Jacob Alexander Homes is the custom build division of Kendall Homes. These projects required a presentation that was elegant, but simply. The beautiful pictures of each project needed to be featured with a minimum of explanation. This was accomplished by using a flexible, responsive theme that supported both slideshow and light box functions. Being accessible on the go is today’s web standard. 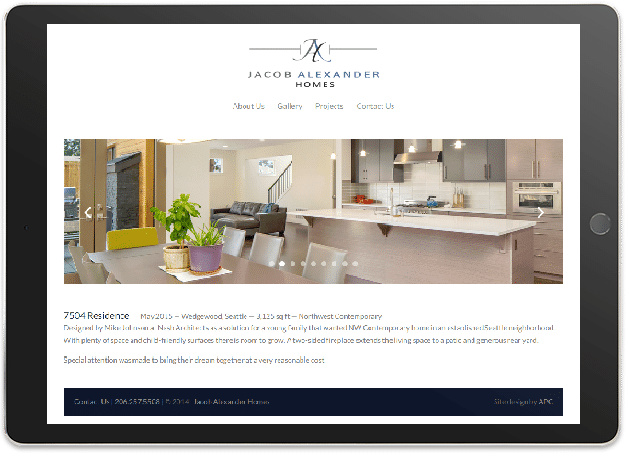 Putting Jacob Alexander Homes on a mobile-ready platform increases search engine optimization and user retention. Both lead to greater customer satisfaction and future referrals. Like What You See? Let's Get Your Project Started Today!